An exquisite, shimmering nebula draped in a veil of interstellar dust is the focus of an image released with new details today (Feb. 16) by the European Southern Observatory. The Messier 78 nebula does not shine with its own light – the ultraviolet radiation from the nebula's stars is not intense enough to ionize the gas to make it glow. Instead, light the nebula's stars ricochets off dust particles in the stellar nursery, illuminating it with scattered blue light. This is why Messier 78 is known as a reflection nebula, because its dust particles simply reflect the starlight that falls on them. The image released today by the European Southern Observatory was originally announced on Jan. 12. But ESO officials unveiled new details about the photo's composition and details in today's announcement. Messier 78, or M78, is one of the brightest reflection nebulas in the sky and can be easily observed with a small telescope. This star-forming region is located about 1,350 light-years away in the constellation of Orion (The Hunter). It can be found northeast of the easternmost star of Orion's belt. The pale blue tint seen in the reflection nebula is an accurate representation of its dominant color. Blue hues are commonly seen in reflection nebulas because of the way the starlight is scattered by the tiny dust particles. The shorter wavelength of blue light is scattered more efficiently than the longer wavelength of red light. This new image of the Messier 78 reflection nebula was taken with the Wide Field Imager on the MPG/ESO 2.2-meter telescope at the La Silla Observatory in Chile. The data used to construct the image were chosen by Igor Chekalin from Russia, who was the overall winner of ESO's Hidden Treasures 2010 astrophotography competition. The contest invited amateur astronomers to dig through ESO's vast archives and transform raw, gray-scale telescope observations into gorgeous full-color images of space. 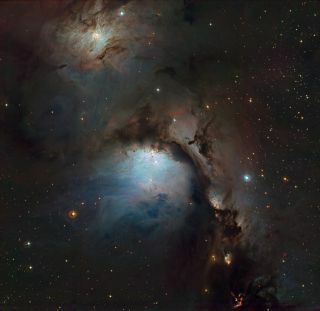 The image of Messier 78 contains several other striking features, including a thick band of dust that stretches across the image from the upper left to the lower right, which obscures the light from the background stars. In the bottom right corner, several pink structures can be seen, which are created by jets of material being ejected from stars that have recently formed and are still buried deep within clouds of dust. Two bright stars, HD 38563A and HD 38563B, are the main powerhouses behind Messier 78. The nebula is, however, home to many more stars, including a collection of about 45 young, low mass stars. These stellar infants, known as T Tauri stars, are less than 10 million years old, and their cores are still too cool for hydrogen fusion to start. Astronomers study T Tauri stars to help understand the early stages of star formation and how planetary systems are created.